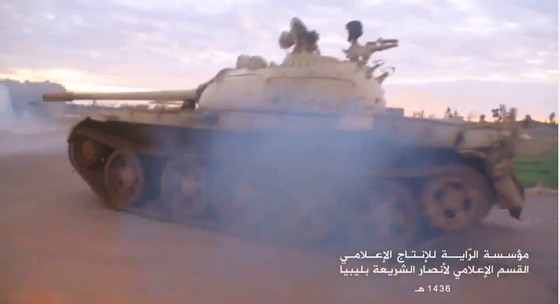 In a new video, Ansar al Sharia Libya claims to have captured tanks and arms during a raid on a camp controlled by pro-government General Khalifa Haftar’s forces. Ansar al Sharia, an al Qaeda-linked group in Libya, has released a six-minute-long video showing its spoils won during a recent battle against forces loyal to General Khalifa Haftar. 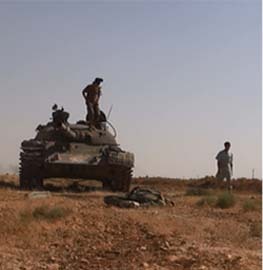 The group claims to have captured tanks and heavy armaments during a Dec. 26 raid on one of Haftar’s camps. 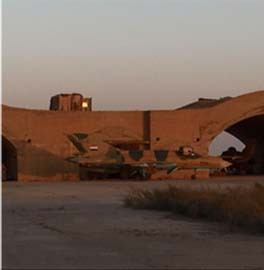 Images of armored vehicles and weapons captured during the jihadists’ operations have become commonplace. But the new video includes scenes of two Ansar al Sharia leaders, both of whom are particularly noteworthy. 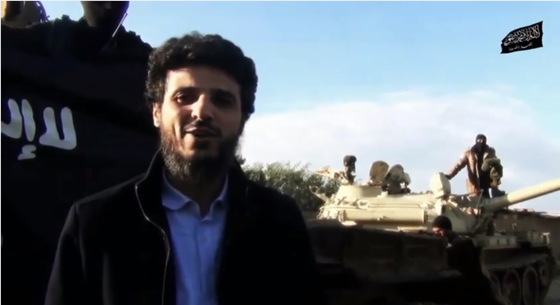 Wissam Ben Hamid, as shown in the newly released Ansar al Sharia video. The first is Wissam Ben Hamid, a jihadist who was a key figure in the security failures surrounding the Sept. 11, 2012 terrorist attack in Benghazi Libya. “By Allah’s grace, today our heroes have achieved victories…they took these tanks and machines as booty from them and killed the soldiers of tyranny that were here at this axis,” Ben Hamid says while standing in front of vehicles captured from Haftar’s camp. In the aftermath of the September 2012 attack in Benghazi, Ben Hamid admitted during press interviews that he was on the scene but did not intervene. He traveled to the airport in Benghazi, where he reportedly met an American security team that was dispatched from Tripoli to provide assistance during the assault on the US Mission and Annex. The security team was mysteriously delayed at the airport for three and a half hours. It is not known if Ben Hamid played a role in the delays. Ben Hamid also met with State Department officials on Sept. 9, 2012 to discuss security in Benghazi. He portrayed himself as a key security official during the meeting. 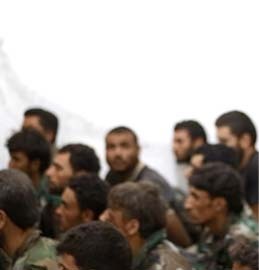 Ben Hamid has appeared in a number of Ansar al Sharia videos and photos since earlier this year. Ansar al Sharia fighters were among the coalition of al Qaeda jihadists who overran the US Mission and Annex, killing four Americans in the process. 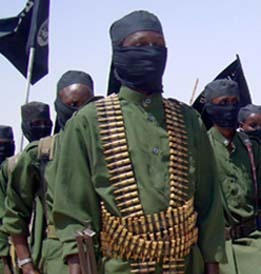 Ben Hamid’s close relationship with Ansar al Sharia raises new questions about his role on the night of Sept. 11, 2012. He is currently a military commander in the Benghazi Revolutionaries Shura Council, an alliance of jihadist groups led by Ansar al Sharia. 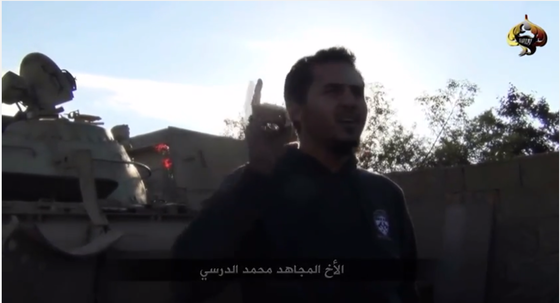 Mohammed al Darsi, as shown in the newly released Ansar al Sharia video. 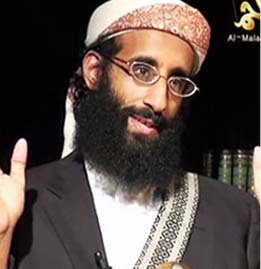 Another speaker in the video is identified as the “mujahid brother” Mohammed al Darsi. The video does not explain who al Darsi is, but he appears to be the same jihadist who was exchanged for a Jordanian ambassador earlier this year. On April 15, Fawaz al Etan, Jordan’s ambassador to Libya, was kidnapped at gunpoint in Tripoli. Just one week later, Jordan released a jihadist named Mohammed al Darsi from prison. Etan was subsequently freed and returned home in May. Al Darsi was detained in 2006 and charged with plotting to attack Western tourists at the Queen Alia International Airport. In April 2007, along with four of his alleged co-conspirators, al Darsi was sentenced to life in prison by a Jordanian court. A sixth defendant had his sentence commuted to 15 years. Some of the convicted jihadists “allegedly told authorities that Al Qaeda in Iraq wanted to claim responsibility for the foiled attack,” the US Embassy in Amman reported. In its Country Reports on Terrorism for both 2006 and 2007, the State Department referred to al Darsi’s plot against the Queen Alia International Airport as being “al Qaeda-linked.” The 2007 report adds that “hotels in Aqaba and the Dead Sea” were also going to be targeted. Still more details were reported by The New York Times in a piece (“Militants Widen Reach as Terror Seeps Out of Iraq“) published on May 28, 2007. Al Darsi was imprisoned in Libya for “militant activities” but he was released in early 2006. According to the Times, al Darsi “had one goal: killing Americans in Iraq.” He contacted an online recruiter, who arranged to meet him in Damascus, Syria. But instead of waging jihad in Iraq, al Darsi was repurposed to take part in the plot in Jordan. “A team of militants from Iraq had traveled to Jordan, where they were preparing attacks on Americans and Jews, [al] Darsi said the recruiter told him,” according to the Times. 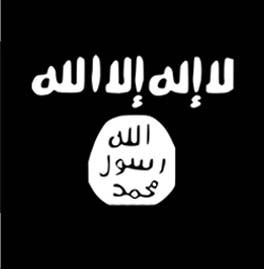 (The State Department has said the cell included “Iraqi, Libyan, and Saudi suspects.”) The recruiter asked al Darsi if he would join the jihadists and “blow himself up in a crowd of tourists at Queen Alia Airport in Amman.” Al Darsi confessed to Jordanian authorities that he agreed to the suicide operation. The Long War Journal cannot independently verify that the Mohammed al Darsi shown in the Ansar al Sharia video is the same man exchanged for the Jordanian ambassador, but it appears to be the same jihadist. The video footage of al Darsi shows a man who looks very similar to the terrorist convicted in 2007 and ultimately released. Therefore, the latest Ansar al Sharia video underscores the longstanding ties between North Africa and the jihad in Iraq. Both al Darsi and Ben Hamid have links to Iraq. Ben Hamid reportedly fought in Iraq, presumably for al Qaeda, before returning to Libya to take part in the revolution. *Oren Adaki, an Arabic language specialist and research associate at the Foundation for Defense of Democracies, contributed to this article. The security failure at benghazi, IMO, was that the special mission compound was opened in the first place. As it turned out there are very few moderates in Libya under arms and the Jihadists and the Islamists were as upset as the Egyptian Islamists were over that Youtube video. Have you ever wondered how so many elements of so many different armed factions could wind up at the Mission compound at the same time with no prior evidence of collusion except Facebook and internet posts the very day of the actual attack most of which reference events in Egypt? None of the investigations thus far have uncovered any evidence of pre planning prior to Sept 11. Not one. This seems to have been pulled off in a single day while the American embassy in Egypt lay under siege with the Islamist government of Mohammed Morsi playing coy and letting loose with doublespeak seemingly condoning the actions of the protestors. Its no wonder the state dept and even Obama had to step carefully in order to not put the lives of so many American diplomats at risk in Egypt. The Jihadist and Islamist anger over the YouTube video explains what happened quite well. Facebook and internet posts that urge Libyans to rise up an throw off the western yoke posting pictures from the events in Egypt at the American embassy posted all day on sept 12 2012 in Libyan islamist forums. Have you ever wondered why the Libyan defenders (Feb 17 militia) didn’t even put up a fight and ran away. What I cant understand is that no one seems interested in the reasons why the FEB 17 Militia gave for running away. The paranoid delusions of stand down orders from Obama , Rice or Jarrett spun by poli tricksters have all fell by the wayside and the idea of a 13 hour firefight at close quarters (one where no one gets hit by bullets) has gone the way of the dodo bird as well. That Obama and Hillary watched it live from the white house while eating popcorn and planning campaign fundraisers in Vegas also turned out to be a cruel purposeful joke. When the Republican controlled house voted to have a special investigation of benghazi, all of the republicans that are on the house intel subcommittee (who had issued their own report) voted against it. Odd huh? not really, if they knew there was nothing to find (after all they found nothing either). All we are left with to cudgel Obama with, are mentions of “security failures”. The lies and myths of Benghazi have been repeated and retweeted so many times in so many political forums and websites, emails and cable news outlets that it is too late to unspin it. The damage is done and it is severe. ‘Remember that the situation was such that not one American lifted a weapon and fired it to save the ambassadors life. I am not criticizing the defenders actions, I am relating the actual events as told by the survivors. Ambassador Stevens was dead along with Sean Smith before any American fired a weapon at the compound. No Americans fired their weapons until AFTER the body of Sean Smith was recovered by the rescue team from the Annex (and it was those men from the annex that fired their weapons inside the compound just minutes before departing). If anyone has information that contradicts my information I would invite a civil discussion of it right here. It’s all been said and done now, but I still remember the 2011 Libyan “civil war” that happened. Not only did I have plenty of legitimate reason to think that not everything was as it seemed, but I just couldn’t shake that gut feeling that something was wrong. I didn’t want to be right about Libya. Say whatever you want about the oppressive governments in the region, but the West essentially handed over Libya to a bunch of racist jihadist zealots. Anybody that disputes that potent fact at this point is simply in denial.